The Loons (N.Am.) or Divers (UK) are a group of aquatic birds found in many parts of North America and northern Europe. 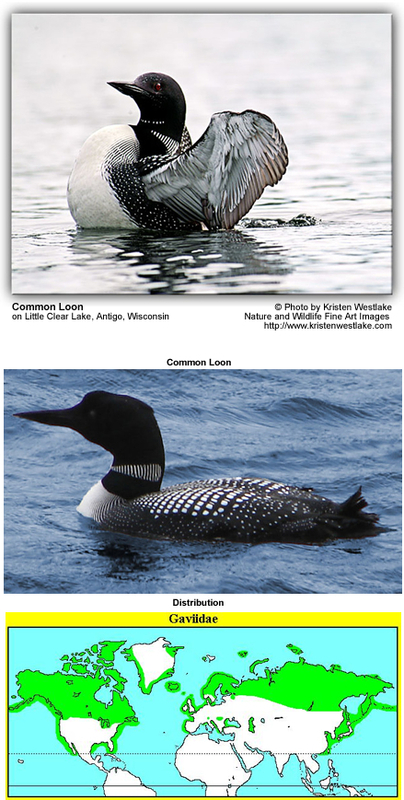 A loon is the size of a large duck or small goose, which it somewhat resembles in shape when swimming, but they are completely unrelated to waterfowl. Their plumage is largely black-and-white, with grey on the head and neck in some species, and a white belly, and they have a spear-shaped bill. All living species of loons are members of one genus (Gavia) in a family (Gaviidae), and order (Gaviiformes) all of their own. Loons are excellent swimmers, using their feet to propel themselves above and under water and the wings for assistance. Because their feet are far back on the body, loons are badly adapted to moving on land. They usually avoid coming ashore, except for nesting. All loons are decent fliers though the larger species have some difficulty taking off, needing a run into the wind to pick up enough velocity to get airborne. Only the Red-throated Diver can take off from land. Once airborne, their considerable stamina allows them to migrate long distances southwards in winter, where they reside in coastal waters. Loons can live as long as 30 years. Loons eat fish, amphibians, and crustaceans, which they hunt for under water, finding their prey by sight. This includes crayfish, frogs, snails, salamanders and leeches. They prefer clear lakes because it is easier to see prey. The loon's pointy bill is used to stab or grasp prey. Vertebrate prey is eaten head first to facilitate swallowing. To help digestion, loons swallow small pebbles from the bottom of a lake. Similar to grit eaten by chicken, these gastroliths may assist the loon's gizzard in crushing the hard parts of the loon's food (the exoskeletons of crustaceans and the bones of frogs and salamanders), as prey is swallowed whole. During the summer, loons nest on fresh water lakes and/or large ponds. Smaller bodies of water (up to 0.5 km²) will usually only have one pair. Larger lakes will have more than one pair, with each pair occupying a bay or section of the lake. Loons build their nests close to the water, preferring sites that are completely surrounded by water. They may use the same site from year to year. Loons will use a variety of materials found nearby to build their nests — pine tree needles, leaves, grass, moss, and sometimes clumps of mud. Both the male and female help with nest building and with incubation, which usually lasts 26-31 days. If the eggs are lost, the pair may re-nest, often in the same general location. Usually one or two eggs are laid in June. Loon chicks are precocial, able to swim right away, but are often seen riding on their parents' back. This behavior allows the chicks to rest, conserve heat, and avoid predators such as large carnivorous fish, snapping turtles, gulls, eagles and crows. After a day or two, chicks do not return to the nest anymore. Chicks are fed exclusively by their parents for the first few weeks of life, and up until eight weeks of age, stay with their parents most of the time. After eight weeks, chicks will begin to dive for some of their own food. By 11 or 12 weeks of age, chicks are able to gather almost all of their own food and may be able to fly. A pair may mate for life, although recent banding studies have shown that loons will sometimes switch mates after a failed nesting attempt and even between nesting attempts in the same season. All living divers are classed in the genus Gavia. Red-throated Diver or Red-throated Loon, Gavia stellata. Black-throated Diver or Arctic Loon, Gavia arctica. Great Northern Diver or Common Loon, Gavia immer.